Italian director Michelangelo Antonio's connection to Pink Floyd comes from his 1970 movie Zabriskie Point. The film is a portrait of sixties youth-sub-culture in the US. The band composed several tracks for the films soundtrack. Three titles where used in the final film which also has music by Jerry Garcia, The Grateful Dead, The Kaleidoscope and others. Among the other Antonioni films are classics like La Notte (1961), The Red Desert (1964) and Blowup (1966). In 1995 the 83 year old Antonioni directed 'Beyond the Clouds' assisted by Wim Wenders. Click below to order videos from AMAZON. Make sure to choose the version that fits your TV-system. The american singer started performing at early age as a backing singer for Ike and Tina Turner. She has made a lot of solo albums from the sixties till today. 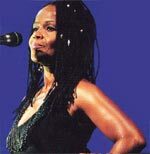 She has also performed in musicals and done sessions with the Small Faces, Peter Gabriel, Oasis and others. In 1992 she appeared on Amused to Death by Roger Waters and she was in his band for the 1999/2000 tour - this can be heard on the live release In The Flesh. She will also join the 2002 world tour.